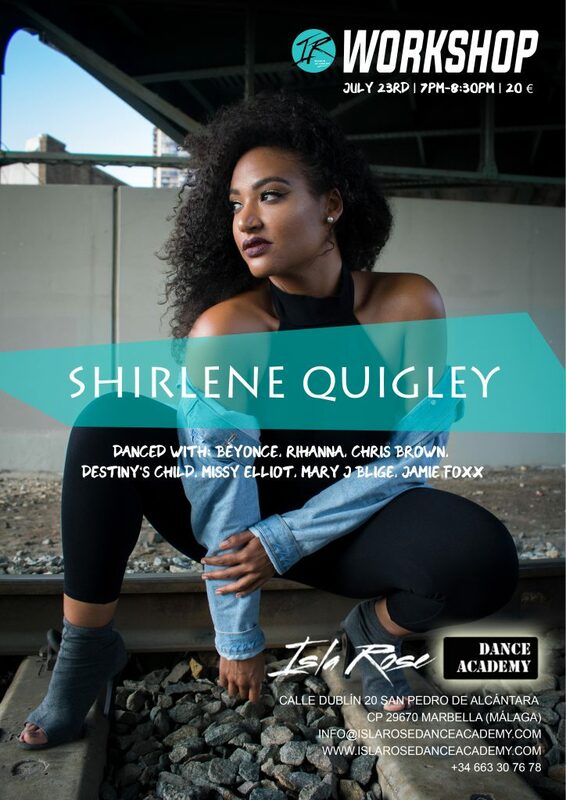 In July 23rd, the famous dancer Shirlene Quigley is coming to the Isla Rose Dance Academy for a commercial hip hop workshop! Born and raised in Los Angeles, California, Shirlene is best known for her work as a professional dancer and international heels instructor. She has performed around the world touring with some of the biggest stars of our generation, dancing on television, commercial, film and music videos with artists such as Beyonce, Rihanna, Chris Brown, Destiny’s Child, Missy Elliot, Mary J Blige, Ashanti, Jamie Foxx and many more. Shirlene began dancing at the age of 18 years old, when she performed as one of the original “uhh ohh girls” on Beyonce’s “Crazy In Love” music video. The next day she found herself traveling the world with Beyonce promoting her first album “Crazy In Love.” She has performed also on many award shows in America and overseas, such as The Grammy’s, VMA’s, Teen Choice Awards, BET Awards, BET Black Girls Rock, Essence Awards, Fashion Rocks, NRJ awards, VMA Japan, ESPY Awards, Soul Train awards. After realizing none of the commercial dance studios held high heel dance classes, she began the first weekly heels class at world famous Millennium Dance Complex, in Los Angeles, and later in New york City, teaching at Broadway Dance Center, Ailey Extension and Peridance. After teaching around the world, Shirlene decided to create New York City’s first High Heel Crew “Queendom”, which has been featured on social media platform, DanceOn, including their debut Youtube video “Mi Gente”, with over one million hit views. Shirlene’s choreography for Queendom, got the attention of music video director, Gerard Victor, and landed her choreography/dancer role in, Fabolous 2018 hit single, “Flipmode”, music video, featuring Chris Brown. The class starts at 7pm and everyone is invited to join. This opportunity is not to be missed. Shirlene´s masterclass is part of our Summer Dance Camp 2018, starting on July 2nd! Where: Isla Rose Dance Academy (Calle Dublín 20, 29670, San Pedro de Alcántara, Marbella, Málaga).